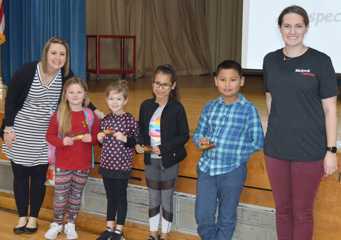 Pictured from left are Tina Fisher (Woodlands Counselor), Hadley Taglialatela, Addison Magnus, Haley Maples, Tyler Weers, and P.I.E. Partner Katherine Neale. Woodlands Elementary School’s P.I.E. (Partners in Education) Partners, Blackwell Dentistry and Exploration Destination, presented four lucky Woodlands Wildcats with $25 Walmart gift cards. Students earn “Wild Cards” for following procedures, then spend them on fun prizes and privileges. All of the Wild Cards that have been spent are periodically put in a drawing. These four students’ names were drawn to win the prizes from Blackwell Dentistry and Exploration Destination.